One of China's renowned historical and cultural city, Xuzhou is located in northern Jiangsu Province. 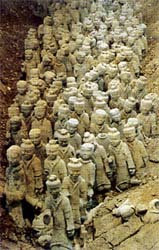 Traces of the culture of the Qin and Han dynasties can be found everywhere there, especially the rocks covered with portraits of the Han Dynasty, the terracotta warriors and horses of the Western Han Dynasty, a jade suit sewn with silver thread, and the ruins of an underground city. Xuzhou features such tourist attractions as the terracotta warriors and horses of the Western Han Dynasty, Yunlong Mountain, museums, Yunlong Lake, tombs of the Han Dynasty in Dongshan Mountain, and the Quanshan Mountain Forest Nature Reserve.